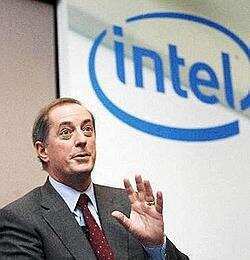 New horizons: Intel Corp. chief executive officer Paul S. Otellini. Bangalore: Intel Corp., the world’s largest chipmaker, said it would provide local computer assemblers drawings, which use the company’s chipsets, to make billing systems for small retailers that are compact and dust proof. Intel said the company decided to provide reference designs in India for the point of sale (PoS) or billing systems, following surveys that showed demand by local kirana shops to automate as they brace for competition from big retail outlets. These terminals could also be used for inventory management. “There is pressure on mom-and-pop shops (to automate)." Intel declined to name either the local PoS manufacturers, who have been tapped for the reference design, or the investment for the initiative, in India. Intel said that the focus on offering design is to ensure computer assemblers make devices based on common standards and bring products faster to the market. The company is working on reference designs for other systems, such as information kiosks and industrial and medical equipment, as demand increases in India for devices that have embedded software, which work on semiconductor chips. Given the growing local demand in India for products and designs that cater to Indian customer’s needs, especially in segments such as communications, automotive, medical and consumer electronics, “Intel’s move could well help design houses in India to deliver just that," said Ganesh Ramamoorthy, principal research analyst at Gartner Inc., an information technology research company. Semiconductor consumption in India will more than double from $7.2 billion (Rs28,656 crore) by 2011 from $2.8 billion currently, driven by growing demand for electronics equipment in India, Gartner Inc. said in August. Intel has launched a programme for design service companies, which build embedded products.